Máy pha cà phê Expobar Elegance 2 Group là loại máy rất thích hợp cho các quán cà phê cao cấp, có công suất cao và giá thị trường máy hợp lý. 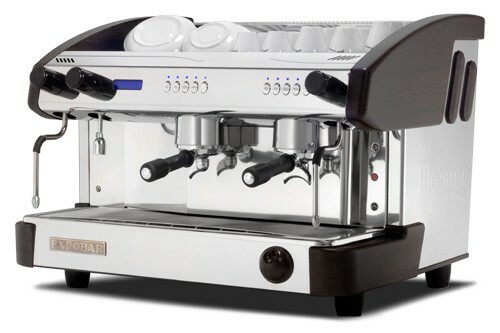 ~ Automatic espresso coffee machine with 2 groups, electronic switchboard to control the coffee dosages volumetrically, with automatic water filling. ~ and copper boiler with 11,5 litres capacity with heat exchanger per group and cleaning valve. ~ Two steam tap (stainless steel) and one hot water tap. ~ Display: advertising, automatic dosing of hot water, time management, and memorization of total brewed coffees. ~ Daily automatic switch ON/OFF of the coffe machine, control of the boiler temperature through display.